A quick and easy breakfast or dessert for when you're craving something sweet! Heat a small, greased pan to medium low heat. Mix all crepe ingredients together. Pour a dollop of the batter in the center of the pan and swirl to spread evenly. Cook for about 30 seconds and flip. Cook for another 10 seconds then repeat process for the other crepe(s). After you have finished cooking the crepes, mix softened cream cheese with stevia to taste. Spread mixture evenly on each crepe then place raspberries in the center. 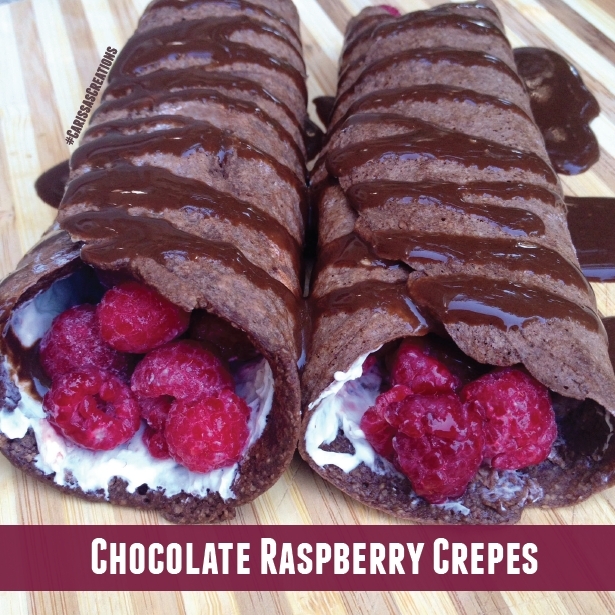 Roll up the crepes and top with walden farms chocolate syrup, or other toppings of choice.